It is difficult to determine the value of an antique, no matter what it is. Perhaps the glib answer is to say it is worth whatever anyone will pay for it. However true, that is not a very helpful response. This article attempts to describe some of the things to look for when putting a value on a game. 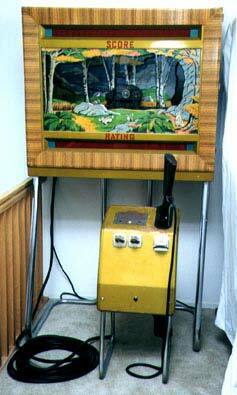 Richard Bueschel, a wonderful antique coin operated game historian provided the basis for the following. There are five factors that contribute to the value of a game. They are related and each one affects the other. They are condition, age, desirability, location, and market. The most important condition used to determine the value of a game is the cosmetic condition. The cosmetic condition of a game is absolutely paramount, with 80%-60% of the value determined by the visual condition of the game. A game with bright, beautiful artwork, shining colors, and complete paint will sell for a premium. Due to the advanced age of these games, some of them over 70 years old, there has been a lot of time for the paint to fade or flake off, for damage due to play to occur, and even for Mother Nature to affect the games. The sun will fade red paint quickly. Some of the paints and finishes used were poor quality and did not adhere to the surface very well. A game that spent most of its life near the ocean, in the humid and salty air will suffer dramatic corrosion and lifting of the paint. The finish on the wood is just as important. A wood finish develops a patina over time due to the oils from touching and wood care soak into the wood over time, giving it a rich, dark look. In some cases, the artwork is so important that if it is not in good condition or is missing, the game has value only for parts. A good example is the pinball machine. Should the backglass be broken or missing, the game can be sold only for parts. Unfortunately there is no good way of repairing a backglass. Flaking paint cannot be painted over because of the way light passes through the different translucent paints. Originality is also critical for the more desirable games. Many coin doors were removed from games when the operators sold the games into the home market. This was to prevent the new owner from placing the game on location and competing with the former owner! There is a thriving business making reproduction parts. Original and good condition instruction cards and advertising boards are highly desirable. For example, many operators removed the advertising boards at the head of the games. These were easily broken off during movement or at certain wild locations. As a result, many games are missing the head or advertising board and these have been reproduced. Many reproductions are well done and many are poor, with little care to the accuracy in the type style, artwork, or colors. In addition the reproductions do not show the same aged patina. Reproductions reduce the value of the game and depending on what part is reproduced, the reduction can be significant. Instruction cards and reward cards were always changing during the life of a game. As newer games appeared, the pricing on the current games was reduced. Rewards were changed based on how stingy the operator was and how much the game was paying out. As these cards changed, the operator printed more, hand-lettered a sign, or disposed of them completely. Originals were difficult to find, especially with the patina of age on them. Again, reproduction parts detract from the value of the game. The mechanical condition is less important than the cosmetic condition. A game can be missing a hidden mechanical assembly and still fetch a good price. This is particularly true for more modern games as many of the assemblies are still available. It is more of a problem if the mechanism is visible, a casting, or is complicated as is found in the much older games. A casting that holds on the legs or lever actuated by the player often is ornate and part of the decoration. Missing a cosmetic mechanism will significantly reduce the value of the game, much as missing artwork. Age plays a stronger role in the value of a game, as the games get older. Games created before World War II were not created in great numbers, have been lost with the passage of time, and are in high demand. Games made during the World War were scarce because companies were focused on the war effort and materials were difficult to obtain. Again these games are in high demand. Games created since the end of the war were created in greater numbers, more have survived the ages, and therefore are not in as great a demand. There are some other factors that affect the value associated with age. The baby boomers, the result in a sudden population increase just after the war, remember games they played as kids. They grow up, become more affluent, and acquire these same games. The demand increases as the children grow to adults and want to relive their childhood. In rare cases, a game is still earning money on location. Its value is affected by the fact it can still earn significant amounts of money through play. As a result, a similar game that is not fun to play and yet is the same age, will sell for significantly less. It is difficult to determine what makes one game more desirable than another. Talk to any collector and you will get as many different answers. Each person appreciates a different attribute of the games they collect and are willing to pay a premium. Some like a particular artist, others appreciate the mechanical ingenuity, and still others want a game that plays well. So a game that has intricate and challenging play will have a higher value. Historians prefer games that have historical significance. One game might be the first with a new feature, such as flippers in a pinball. Another might be the first time a noisemaker was used or electricity was used to move something. Each of these carries a premium. Where the game is and where it will reside both affect the value of the game. Shipping, legality, export and import rules and premiums, and packaging all affect the end value for a buyer. Packaging and shipping a game can be a significant portion of the purchase price of a game. The father the game has to travel, the less the buyer is willing to pay. The costs of packaging a game for overseas shipping can exceed the value of the game. Games may not be legal in an area and may need a licensed seller or shipper to move out of the illegal area. Again, this reduces the value of the game. Many games originated in a particular area and are therefore common, thus reducing the value. In other areas, the games are not common and the demand is high, resulting in a higher valuation. For example, pinballs were manufactured and played mostly in the mid-West, the Chicago area. The older games are common and reduced in value, whereas older pinballs are difficult to find in California on the West Coast and therefore command a premium. The market forces of supply and demand come into play here just like with any other commodity. These forces were alluded to above. There are price guides that attempt to place a value on many of the games, including pinballs, slot machines, arcade games, and other collectables associated with coin operated games. Depending on how careful and rigorous the author is in determining the stated values, these can provide valuable information. If the data gathered is substantial, validated, gathered over a reasonable period of time, and analyzed, they can be believed. However it is not uncommon to see false results that are clearly out of line with the market value. For example, it is known one author of a price guide will inflate the value of games he has for sale in an attempt to get additional money. There are changes in the next annual guide that reflect his new inventory. As can be seen from the information above, appraising these games is difficult. For this reason, I do not charge for appraisals. Therefore I also will not be responsible for any errors or subsequent use of the information. Please be prepared to provide detailed pictures of the game and a history if known. Please contact the Sands Mechanical Museum for any questions. Auctions do not necessarily help establish the value of a game. Auctions are subject to misrepresentation where the seller promotes the strong points of a particular game and neglects to mention or even hides the flaws. Auctions are abused where shill bids advance the price, bids are sniped at the last second, and various other schemes are used to keep honest bidders from participating in a fair auction. Often the value of a game is represented as being identical to a similar game that sold at auction for a high value. Because of the abuse and inability to verify an honest auction, these values should be ignored unless they can be verified as being legitimate. Thanks also to the Prewar Pinball group on Yahoo for reviewing the draft and providing helpful comments.